Norman Mailer walks into a bar. Not just any bar, though: it’s the legendary White Horse Tavern, where Dylan Thomas drank himself to death, and where, in the 1960s, a young jazz journalist from Buffalo, N.Y., named Ishmael Reed, liked to lurk and stargaze. That’s not hyperbole. For a writer whose sensibility has always tilted toward the surreal and experimental (Nathanael West was an early and important influence), whose political incorrectness has been so brazen, his public feuds with other writers (pre-eminently feminists) so frequent and bitter, and his critique of white America so relentless, it might seem astonishing that he’s been as lavishly feted by the very establishment and in the very mainstream he typically excoriates. 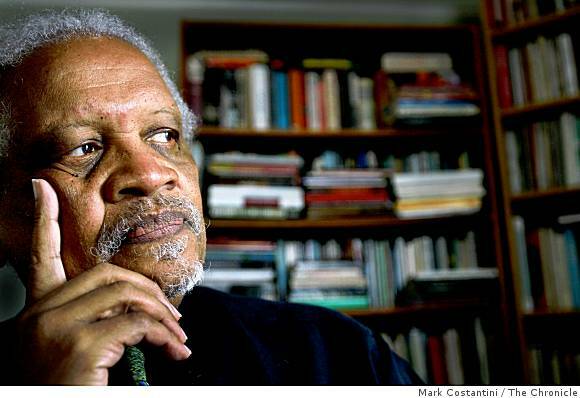 His books have twice been nominated for the National Book Award, and he’s received a Los Angeles Book Prize, the Langston Hughes Medal, the Lila Wallace Reader’s Digest Writers’ Award, and fellowships from the Guggenheim and the National Endowment for the Arts. In 1998 he received a MacArthur “genius” grant. He’s been consistently productive, with nine novels, six poetry collections, eight books of essays, one libretto, 13 anthologies, and six plays. He blogs. He recently retired after teaching at Berkeley for 35 years. He’s the founder of his own publishing imprint, his own jazz quintet, two online literary magazines, and a literary foundation that presents the annual American Book Award. Even the Reed home seems like a happy hive of continuous creativity: he and his wife of 40 years, the choreographer Carla Blank, co-edited the literary anthology, Pow Wow: American Short Fiction from Then to Now, and play in his quintet together, Reed on piano, Blank on violin. His imprint recently published his mother’s memoir. And every Saturday morning, he holds an informal writing workshop with his two daughters—both writers—at a local Starbucks. In his latest book, Juice! (Dalkey, Apr. ), Reed holds his mirror up to the media coverage of trials—and especially its portrayal of black and Latino men—as his protagonist Paul Blessing becomes obsessed with the coverage of the O.J. Simpson trial and spectacularly unravels. It’s this optimism about new technologies and his unwillingness to rest on his laurels—not to mention his humor, especially about his own reputation and public persona—that his critics overlook. But they can trust that nothing they say about Reed goes unnoticed.